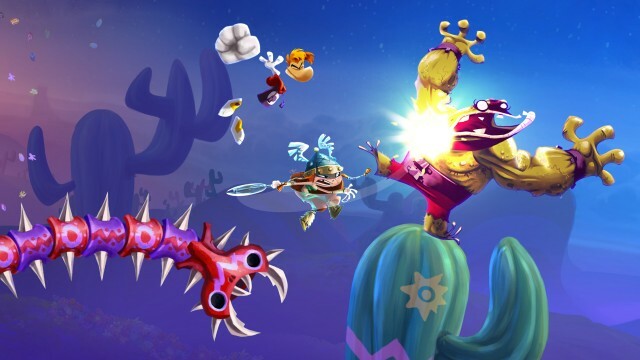 Some of our longtime readers may recall that in the earlier days of our coverage of Rayman Legends, Ubisoft released a gameplay video showcasing a very clever music-based gameplay mechanic that players can expect to see in the finished product. This video displayed Rayman running nonstop through a level and jumping, sliding, and punching to the beat of the classic rock song Black Betty. Since the video’s initial release, that particular level, going by the name Castle Rock, has been made available to the public via demos of the game at store kiosks, on the Wii U eShop, and recently as part of the game’s free Online Challenge App. Developer interviews stated that there will be more levels like this in the final product, and now, we get to see a look at another one of them. This particular video showcases series newcomer Barbara making her way through a newly-revealed Day of the Dead-themed world to an acoustic cover of Survivor’s trademark tune, Eye of the Tiger, complete with kazoos on backup. Several new promotional screenshots are also included. We’ll keep you updated on Rayman Legends as news breaks. Until then, feel free to post your thoughts on this new video in the comments below.